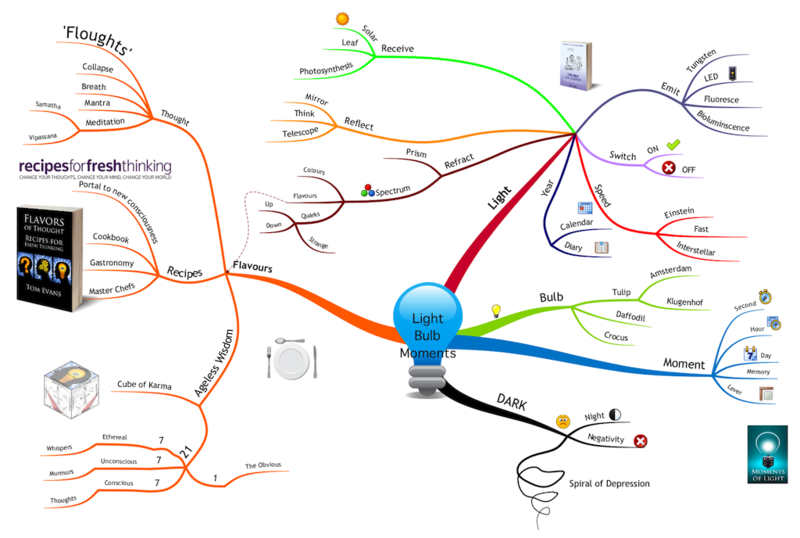 When I trained as an iMindmap Instructor a few years ago, I was introduced to the concept of limiting each branch of the map to a single word. At first, I didn’t go along with this idea as I thought the application of any ‘rule’ might limit the creative flow. Once I learned, however, to see it as a discipline as opposed to a draconian rule, the benefits and reasoning behind it became crystal clear. A year or so ago, I was stuck on chapter 9 of of my book on Light Bulb Moments. It wasn’t flowing so I used Tony Buzan’s technique of free association Mind Mapping on the words “light”, “bulb” and “moment”. Now had I mapped using the phrase “light bulb moment”, my mind might have been lead to “Edison” and then “phonograph” or “Topsy the Elephant” (Google it) or to “Eureka”, “Archimedes” and “bath water”. Instead, as you can see on the map below, “Bulb” took me to “tulip” and to “Amsterdam”. The word “Moment” in isolation made me realise we have a moment in time and the moment of a lever around a fulcrum. As a result, I started a series of podcasts called “Moments of Light” in which people talk about how they had a light bulb moment and did something with it. The word “light” as you might imagine provided a deep and wide source of metaphor and association. Light of course can be split into a spectrum of component colours. It made me realise that quantum physicists ascribe many attributes like spin, colour and flavour to exotic particles like quarks. Then a light bulb moment came in. Is it possible that thought itself has properties like colour or flavours? At that point, the writer’s block vapourised and the result was a chapter called “Flavours of Thought” which I didn’t plan to write. This led to writing a whole book of the same name a month later that I didn’t plan to write either. As chefs use a mix of flavours in their concoctions, I also combined the flavours of thought into various recipes too. As a result, about a year later a membership site appeared on the scene called “Recipes for Fresh Thinking” that I didn’t plan to build. I started training “Master Chefs of the Mind” to solve many common mind-based issues prevalent in every day life. I then came across some esoteric material on something called the Cube of Space. I found I could map my Flavours on to the Cube. As a result, I found I had from nowhere created an amazing tool for personal evolution and advancement. This in turn lead to a new practitioner programme called the Cube of Karma that I had no plan in developing. I see it now as a gastronomic recipe of all the flavours of thought. None of this was planned, none of it was foreseen. This all shows the power of a true Mind Map.